Prep Day: cut 10 squares of foil 1 1/2 times the size of the corn. Place each ear of corn on the center of foil. In a small bowl, stir together the parm, mayo, herb, garlic, sugar, juice, and cayenne until it forms a thick paste. Rub 2 T. of the paste over each piece of corn, and then seal the corn in the foil. Store in freezer bag. Freeze up to one month. Serve Day: Thaw in fridge. Preheat oven to 400F. 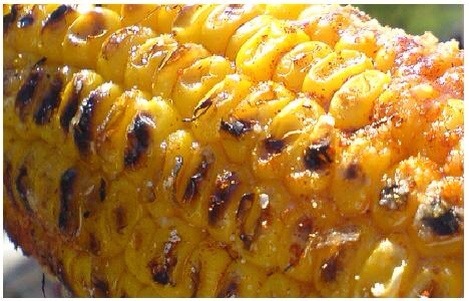 Place wrapped corn on a baking sheet and allow to come to room temp for 30 minutes. Bake the corn for 10 minutes, turn the corn over, and bake for another 10 minutes. Serve hot in the foil.